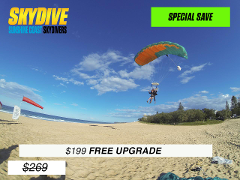 Includes Brisbane transfers: The highest skydive - 15,000ft jump up to 70 seconds of Adrenalin-pumping free fall, 15-20 minute flight over the beautiful Sunshine Coast including a beach landing. Includes Brisbane transfers: 12,000ft Tandem Skydive, 15-20 minute flight over the beautiful Sunshine Coast including a beach landing. Includes Brisbane transfers: 10,000ft Tandem Skydive, 15-20 minute flight over the beautiful Sunshine Coast including a beach landing. Includes Noosa transfers: SPECIAL FREE upgrade to 12,000ft 100% beach landing. 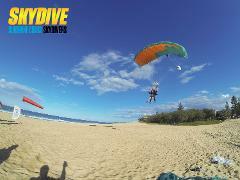 Choose up to 15,000ft of Adrenalin-pumping free fall, 15-20 minute flight over the beautiful Sunshine Coast.